Questioner: I should like to know what you mean by awareness because you have often said that awareness is really what your teaching is about. I’ve tried to understand it by listening to your talks and reading your books, but I don’t seem to get very far. I know it is not a practice, and I understand why you so emphatically repudiate any kind of practice, drill, system, discipline or routine. I see the importance of that, for otherwise it becomes mechanical, and at the end of it the mind has become dull and stupid. I should like, if I may, to explore with you to the very end this question of what it means to be aware. You seem to give some extra, deeper meaning to this word, and yet it seems to me that we are aware of what’s going on all the time. When I’m angry I know it, when I’m sad I know it and when I’m happy I know it. Krishnamurti: I wonder if we really are aware of anger, sadness, happiness? Or are we aware of these things only when they are all over? Let us begin as though we know nothing about it at all and start from scratch. Let us not make any assertions, dogmatic or subtle, but let us explore this question which, if one really went into it very deeply, would reveal an extraordinary state that the mind had probably never touched, a dimension not touched by superficial awareness. Let us start from the superficial and work through. We see with our eyes, we perceive with our senses the things about us – the colour of the flower, the humming bird over the flower the light of this Californian sun, the thousand sounds of different qualities and subtleties, the depth and the height, the shadow of the tree and the tree itself. We feel in the same way our own bodies, which are the instruments of these different kinds of superficial, sensory perceptions. If these perceptions remained at the superficial level there would be no confusion at all. That flower, that pansy, that rose, are there, and that’s all there is to it. There is no preference, no comparison, no like and dislike, only the thing before us without any psychological involvement. Is all this superficial sensory perception or awareness quite clear? It can be expanded to the stars, to the depth of the seas, and to the ultimate frontiers of scientific observation, using all the instruments of modern technology. Krishnamurti: So you see that the rose and all the universe and the people in it, your own wife if you have one, the stars, the seas, the mountains, the microbes, the atoms, the neutrons, this room, the door, really are there. Now, the next step; what you think about these things, or what you feel about them, is your psychological response to them. And this we call thought or emotion. So the superficial awareness is a very simple matter: the door is there. But the description of the door is not the door, and when you get emotionally involved in the description you don’t see the door. This description might be a word or a scientific treatise or a strong emotional response; none of these is the door itself. This is very important to understand right from the beginning. If we don’t understand this we shall get more and more confused. The description is never the described. Though we are describing something even now, and we have to, the thing we are describing is not our description of it, so please bear this in mind right through our talk. Never confuse the word with the thing it describes. The word is never the real, and we are easily carried away when we come to the next stage of awareness where it becomes personal and we get emotional through the word. So there is the superficial awareness of the tree, the bird, the door, and there is the response to that, which is thought, feeling, emotion. Now when we become aware of this response, we might call it a second depth of awareness. There is the awareness of the rose, and the awareness of the response to the rose. Often we are unaware of this response to the rose. In reality it is the same awareness which sees the rose and which sees the response. It is one movement and it is wrong to speak of the outer and inner awareness. When there is a visual awareness of the tree without any psychological involvement there is no division in relationship. But when there is a psychological response to the tree, the response is a conditioned response, it is the response of past memory, past experiences, and the response is a division in relationship. This response is the birth of what we shall call the “me” in relationship and the “non-me”. This is how you place yourself in relationship to the world. This is how you create the individual and the community. The world is seen not as it is, but in its various relationships to the “me” of memory. This division is the life and the flourishing of everything we call our psychological being, and from this arises all contradiction and division. Are you very clear that you perceive this? When there is the awareness of the tree there is no evaluation. But when there is a response to the tree, when the tree is judged with like and dislike, then a division takes place in this awareness as the “me” and the “non-me”, the “me” who is different from the thing observed. This “me” is the response, in relationship, of past memory, past experiences. Now can there be an awareness, an observation of the tree, without any judgement, and can there be an observation of the response, the reactions, without any judgement? In this way we eradicate the principle of division, the principle of “me” and “non-me”, both in looking at the tree and in looking at ourselves. Questioner: I’m trying to follow you. Let’s see if I have got it right. There is an awareness of the tree, that I understand. There is a psychological response to the tree, that I understand also. The psychological response is made up of past memories and past experiences, it is like and dislike, it is the division into the tree and the “me”. Yes, I think I understand all that. Krishnamurti: Therefore there is no “me” who is the description in the seeing of this fact. In the seeing of any fact there is no “me”. There is either the “me” or the seeing, there can’t be both. “Me” is non-seeing. The “me” cannot see, cannot be aware. Questioner: May I stop here? I think I’ve got the feeling of it, but I must let it sink in. May I come again tomorrow? Questioner: I think I have really understood, non-verbally, what you said yesterday. There is the awareness of the tree, there is the conditioned response to the tree, and this conditioned response is conflict, it is the action of memory and past experiences, it is like and dislike, it is prejudice. I also understand that this response of prejudice is the birth of what we call the “me” or the censor. I see clearly that the “me”, the “I”, exists in all relationships. Now is there an “I” outside of relationships? Krishnamurti: We have seen how heavily conditioned our responses are. When you ask if there is a “me” outside of relationship, it becomes a speculative question as long as there is no freedom from these conditioned responses. Do you see that? So our first question is not whether there is a “me” or not outside of conditioned responses, but rather, can the mind, in which is included all our feelings, be free of this conditioning, which is the past? The past is the “me”. There is no “me” in the present. As long as the mind is operating in the past there is the “me”, and the mind is this past, the mind is this “me”. You can’t say there is the mind and there is the past, whether it is the past of a few days ago or of ten thousand years ago. So we are asking: can the mind free itself from yesterday? Now there are several things involved, aren’t there? First of all there is a superficial awareness. Then there is the awareness of the conditioned response. Then there is the realization that the mind is the past, the mind is this conditioned response. Then there is the question whether this mind can free itself of the past. And all this is one unitary action of awareness because in this there are no conclusions. When we say the mind is the past, this realization is not a verbal conclusion but an actual perception of fact. The French have a word for such a perception of a fact, they call it “constatation”. When we ask whether the mind can be free of the past is this question being asked by the censor, the “me”, who is that very past? Questioner: Can the mind be free of the past. 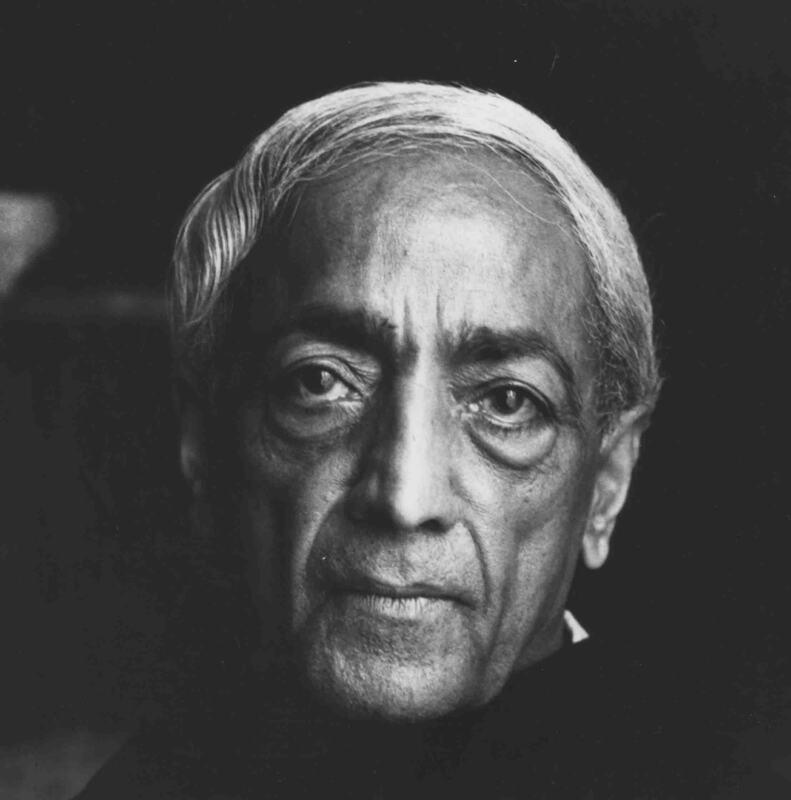 Krishnamurti: Who is putting that question? Is it the entity who is the result of a great many conflicts, memories and experiences – is it he who is asking – or does this question arise of itself, out of the perception of the fact? If it is the observer who is putting the question, then he is trying to escape from the fact of himself, because, he says, I have lived so long in pain, in trouble, in sorrow, I should like to go beyond this constant struggle. If he asks the question from that motive his answer will be a taking refuge in some escape. One either turns away from a fact or one faces it. And the word and the symbol are a turning away from it. In fact, just to ask this question at all is already an act of escape, is it not? Let us be aware whether this question is or is not an act of escape. If it is, it is noise. If there is no observer, then there is silence, a complete negation of the whole past. Questioner: Here I am lost. How can I wipe away the past in a few seconds? Krishnamurti: Let us bear in mind that we are discussing awareness. We are talking over together this question of awareness. There is the tree, and the conditioned response to the tree, which is the “me” in relationship, the “me” who is the very centre of conflict. Now is it this “me” who is asking the question? – this “me” who, as we have said, is the very structure of the past? If the question is not asked from the structure of the past, if the question is not asked by the “me”, then there is no structure of the past. When the structure is asking the question it is operating in relationship to the fact of itself, it is frightened of itself and it acts to escape from itself. When this structure does not ask the question, it is not acting in relationship to itself. To recapitulate: there is the tree, there is the word, the response to the tree, which is the censor, or the “me”, which comes from the past; and then there is the question: can I escape from all this turmoil and agony? If the “me” is asking this question it is perpetuating itself. Now, being aware of that, it doesn’t ask the question! Being aware and seeing all the implications of it, the question cannot be asked. It does not ask the question at all because it sees the trap. Now do you see that all this awareness is superficial? It is the same as the awareness which sees the tree. Questioner: Is there any other kind of awareness? Is there any other dimension to awareness? Krishnamurti: Again let’s be careful, let’s be very clear that we are not asking this question with any motive. If there is a motive we are back in the trap of conditioned response. When the observer is wholly silent, not made silent, there is surely a different quality of awareness coming into being? Questioner: What action could there possibly be in any circumstances without the observer – what question or what action? Krishnamurti: Again, are you asking this question from this side of the river, or is it from the other bank? If you are on the other bank, you will not ask this question; if you are on that bank, your action will be from that bank. So there is an awareness of this bank, with all its structure, its nature and all its traps, and to try to escape from the trap is to fall into another trap. And what deadly monotony there is in all that! Awareness has shown us the nature of the trap, and therefore there is the negation of all traps; so the mind is now empty. It is empty of the “me” and of the trap. This mind has a different quality, a different dimension of awareness. This awareness is not aware that it is aware. Krishnamurti: Nobody can push you out of your trap – no guru, no drug, no mantra, nobody, including myself – nobody, especially myself. All that you have to do is to be aware from the beginning to the end, not become inattentive in the middle of it. This new quality of awareness is attention, and in this attention there is no frontier made by the “me”. This attention is the highest form of virtue, therefore it is love. It is supreme intelligence, and there cannot be attention if you are not sensitive to the structure and the nature of these man-made traps.